It's been a long but happy day. Hallowed is on the shelves! You'd think I'd get used to the idea, after all this time, but this year I was yet again struck dumb at the bookstore in sheer amazement that it was my. book. on. the. shelves!!!!! Wow. There's some sneaky little corner of my mind that still whispers, "Don't they know that you made this entire thing up? No, really. You made this entire Clara-the-angel-blood thing up. From your brain. That's all." See? Don't I look dazed? And there was a HUGE pile of my books at the Idaho Falls Barnes & Noble, in preparation for Saturday's signing﻿, and posters with my picture on them all over the store. Talk about surreal. . .
See the lovely display and the bunches of books? Now I have to go to sleep, because I am doing my first ever Author School Visit tomorrow morning. For someone who teaches writing for a living, I am surprisingly nervous. Wish me luck! And thank you, all you readers out there, all you book bloggers, all you friends and neighbors and colleagues, all you fellow writers, for making me feel so loved and so important on this very fine day. I expect to see some Christian love once people have read the book! That's awesome! 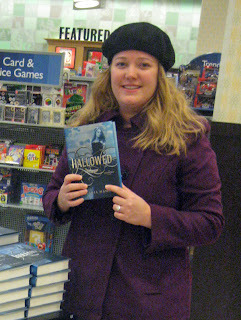 I've read Hallowed and am glad to have that copy finally on my shelf. I finished it in such a short time span because the book was like a bomb with sheer amazingness. Good luck with your Author School Visit! I read Hallowed all day yesterday and wow, I don't think a book has had such a huge emotional impact on me in a very long time. After I finished it, I sat down and cried for the longest time. I've been digesting it now for a full day and there's still so much to think about. 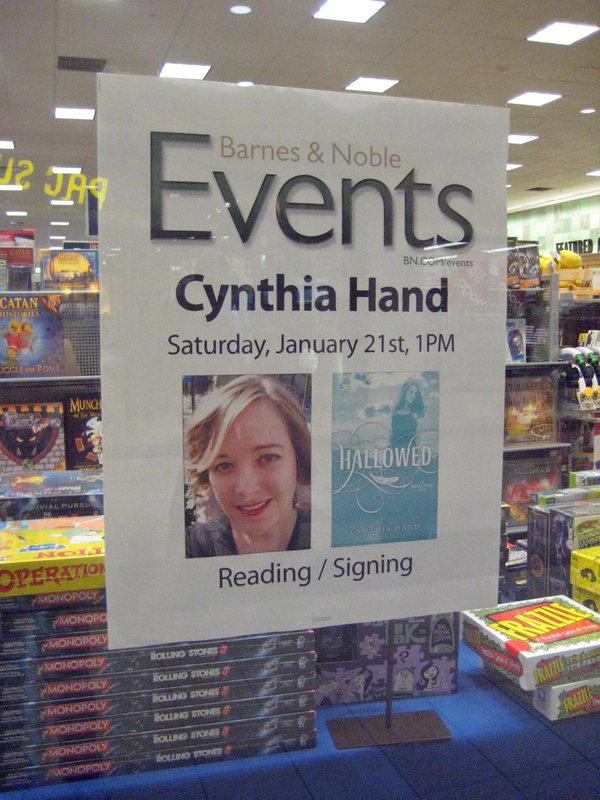 Thank for writing such an amazing novel, Cynthia, and thank you for indirectly encouraging me to be a good writer. My dream is that the stories I want to tell will one day have the same effect on someone else that Hallowed did on me. I hope your school visit and signing go well. Reading the bok right now!!!!!!! I missed out getting it on launch day because I thought it came out on the 16th, not the 17th, haha. Now I have to wait to pick it up until the 21st when I come to the Idaho Falls signing. I'm really excited because I've never been to one before! Ahhhhh!!!!!!! I can't wait to get this book!! I am so team Tucker, I like Christian, but Tucker is like sweet country boy. Are those your only book signing? Well I hope I can get this book soon!!!!! Just finished it after reading all day!!! I must say, it exceeded my expectations. LOVED LOVED it. My heart is still aching and I hope the next book comes to us very very very soon! You are an amazing writer!!! 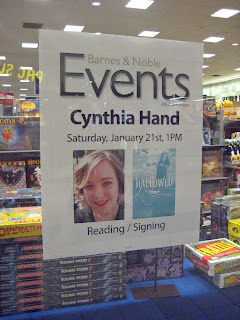 Hi Cynthia I can't wait to read hallowed but I can't seem to find it in amazon uk is it not released yet? team Christian!!! I love him... such a good book. I think that Clara and Christian are really cute together. I really don`t like Tucker, is not really my type of boy. You are important! To all of us who love your books!! Hopefully there´s more to come the next years, I can´t wait to read the next book of yours. Thank you soooo much for giving me the ARC of Hallowed ... signed and all ... sigh! I have received it a couple of days ago and of course I had to read it instantly! And so loved it! (Like I stated in Goodreads, I "inhaled" it.) This may sound a little creepy, but I told my husband I want that book in my grave with me, really. I´m so proud of it! Thank you again, you made my day, my week, my month, my year ... and that has yet only started. From the bottom of my heart I wish you the very best for this year, for your promotion´s tour, for the third book´s writing process, for reconciling family and business as smoothly as possible. @Anonymous: Check Amazon.co.uk again, I entered "Hallowed" and found it immediately! Hi there yes I found it but not as an Ebook for my kindle which is what I want Sony know when it will be released? Thank you Cynthia for giving me such a great book to read yesterday. It makes you feel for the characters in a way I never thought possible, and despite the angels, it's so realistic. When Mom died in it, I cried like she had been my own mother. Thank you so much!! I read Hallowed super quick and I am now dying for book three. 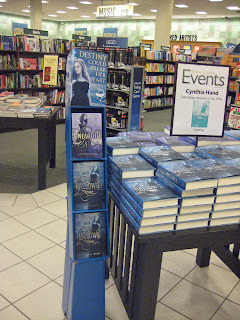 Congrats on the book birthday and I hope that everyone loves Hallowed as much as I did! Thank you for Hallowed- it was a great continuation of the first book. I felt really about about Tucker. Christian was great and all but I was still rooting for Tucker, he just seems more lovable:-) Please give us the third book SOON!!!! Congratulations on making the New York Times bestsellers list! I just wanted to tell everyone that im TEAM TUCKER!!!!! @Anonymous: OMG I love love love your comment!!! I was laughing so hard when I was reading it. I could have written this, Tucker is the biggest book crush I´ve ever had, I love him even more than I did Edward (y know, Cullen). Trust me, Tucker will be well and alive in Cynthia´s third book, I mean it was Jeffrey´s purpose to save him, so she can´t just let him die, right? There was a purpose in Jeffrey´s purpose, that´s what I believe. It´s even funnier how you changed your mind in the course of reading this book. A few days ago you were totally into Chris... He seems to be a decent guy and nice enough, but I can´t feel love between him and Clara like I do between Clara and Tucker. Team Tucker forever!! Hallowed is a great book . I love it! Normally death is a sad occasion but you made dying happy :D kudos. Mitch Wieland posted on Facebook that your second book is out. It's great to see that you're published. We took a couple of classes together back in the day at BSU. I'm still figuring out what type of writer I want to be when I grow-up! Blogging has been a way for me to get back into writing. Shocking that teaching high school English zapped my creative energy... Anyway, all the best. haha thanks so much!!! i took me a while to try to get all my word out i was so sad/mad. where is the love??? i mean between chis and clara.. i mean there both angels and that triplionare thingy (sry dont know how to spell it!!!) Ummmm.... idk.. there both going to Stanford so ummmm.... BUT TUCKER!!!!! HE GOT ALL SAD AND DEJECTED IT MADE ME WANNA PUNCH CHRIS'S FACE OUT (i could totally NOT do it but i could try) but man TUCKER.. peops come on TUCKER... he's all cute and squishy and soft and fuzzy... OMG IF THERE WAS A REAL TUCKER (nice and cute and squishy and soft and fuzzy and UBER FUNNY) I TOTALLY CALL DIBS!!!!!!!!!!!!!!!!!!!!!!!! I TOTALLY AGREE TEAM TUCKER FOREVER!!!!!!!!!!!!!! !